Harry Potter Fans: You Will NOT Want To Miss This Event! You are here: Home / freebies and free samples / Harry Potter Fans: You Will NOT Want To Miss This Event! Are you or is someone you know a Harry Potter fanatic?? If so, be sure to mark your calendar for Friday, December 9. 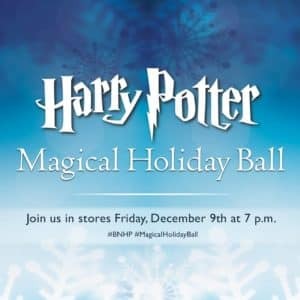 Barnes & Noble is hosting a Harry Potter Magical Ball in stores beginning at 7:00 PM on 12/9. This magical and fun event will be open to Harry Potter fans of all ages. At the Magical Ball you will find music, dancing, costumes (they are encouraged! ), holiday decorations, and Harry Potter crafts! This event is being held at every Barnes & Noble store throughout the United States! There is no cost to attend this Harry Potter event. This magical Ball does not have a set ending time; however, it should conclude prior to the closing of your local Barnes & Noble store. To find out more information, you can contact a Barnes & Noble store near you or visit the Barnes & Noble website. So, who will you dress up as? Harry, Ron, Hermione? Maybe even a Griffin or a Hippograff? Remember, the Harry Potter Magical Ball will only be held on December 9. Don’t miss out on this magical evening! Be sure to invite your friends so you can have an extra special time. This fun event was inspired by the Yule Ball described in Harry Potter and the Goblet of Fire.